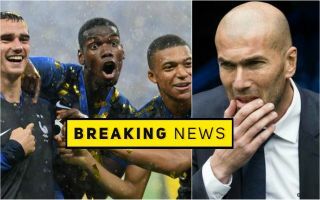 Antoine Griezmann has revealed a Manchester United transfer approach from prospective new manager Zinedine Zidane in a chat with France international team-mate and Red Devils star Paul Pogba. Sources close to Zidane recently told CaughtOffside of his contact with Pogba and another Frenchman Anthony Martial as he believes he could be offered the job of replacing Jose Mourinho as United boss in the very near future. CaughtOffside have been told again by a Zidane connection that the 46-year-old has also sounded out potential transfer targets for if he does wind up at Old Trafford soon. Griezmann is among those, and the Atletico Madrid forward has since relayed this information to Pogba during this latest international break. Not much more is known about how the player reacted to these talks, or if he indeed has any serious thoughts about leaving his current club after only recently signing a new contract with them this summer. It would seem, however, that Zidane is keen on the 27-year-old, who has been one of Europe’s best attacking players in recent years. In 2018 alone, the Frenchman has played a major role in helping Atletico win the Europa League, before a key role again for his national side as they won the World Cup in the summer. United could do with a player of his calibre in their ranks after the poor form of Alexis Sanchez since he joined from Arsenal in January. Old Trafford sources continue to keep their cards close to their chest regarding Mourinho’s future, with plenty of mixed messages in the press at the moment. The Express yesterday translated a report from German source Bild stating Zidane is United’s first choice, but that Wolves manager Nuno Santo could also be in the frame. Don Balon, meanwhile, have also linked Griezmann as a target for United and Manchester City, and point out his £180million release clause that could no doubt complicate a transfer as well. United have spent big in the past and may do so again under the right manager, with executive vice-chairman Ed Woodward notably failing to back some of Mourinho’s targets this summer. CaughtOffside were told that there were disagreements over the likes of Jerome Boateng due to the short-termist nature of some of Mourinho’s thinking, so it seems very possible that this strained relationship cannot continue for too much longer. Diario Gol, meanwhile, have also reported that Mourinho’s agent Jorge Mendes can’t see his client lasting at United until Christmas, with the Portuguese actually approaching his old club Real Madrid about a possible job already. It has not been the best start to the season for United, who have lost two of their opening four games, though they bounced back with a 2-0 victory at Burnley last weekend. Could we see Paul Pogba and Antoine Griezmann together at Manchester United?